Today the Islanders announced they have re-signed winger Chris Simon to a 1 year contract worth $475,000 with incentives that make the deal worth $800,000. The cap hit will only be for the 475K. At first, I didn't really want Simon back but at this deal you can't go wrong, even though he will miss the first 5 games of the season because of the suspension from the Hollweg incident. He had 10 goals and 17 assists in 67 games last season, along with a +17 rating. He appears more valuable than I thought he was to the team last year. This now gives the Isles 13 forwards, and it seems like they might try and work out a deal or 2 to add some skill. There are no rumors about that right now, but there were in the past and Snow might revisit some trade talk he has had with teams in the last few months. As for the defense, the Isles are looking to add one of the free agents, most likely Danny Markov. Markov would be a perfect fit here in Ted Nolan's system and would become a fan favorite because of the style he plays. He wanted a multi-year deal, but since he hasn't recieved an offer like that rumors began circulating on Friday that Markov was close to a 1 year deal with the team. There has been no more news on this today, but it seems the Isles search for a defensman is indeed heating up and could be announced shortly, most likely with Markov. In my opinion, I still feel that the team should add 2 defenseman and trade for a 1st or 2nd line forward, wither a LW or a center. The Isles still need an offensive defenseman, and the only options on the free agent market for that are David Tanabe or Bryan Berard. So if the Isles really want to get a defenseman who can contribute offensively, they may have to make a trade for one. It seems they are set on only signing 1 defenseman, but who knows what is really up with the team. Simon was listed on the NHLPA website as signed for 475K since Saturday, and the team only announced this today. Everything is tight lipped there, and we'll see in the coming weeks how the defense shapes up and maybe see if there is a change on offense. Still lots of time remaining to improve the team, and it seems Snow will use up as much of it as he can. AL ARBOUR WILL RETURN TO THE ISLES BENCH FOR ONE NIGHT! The New York Islanders have announced the return of head coach Al Arbour. Al Arbour will sign a one day contract on November 2nd, and will be behind the bench for the Isles on November 3rd against the Pittsburg Penguins. It will be on this night that Arbour will have coached his 1,500th NHL game with the Islanders. Ted Nolan made the discovery recently that Arbour had coached 1,499 games with the Islanders, and thought it would be fitting to have the Hall Of Fame coach step behind the bench one more time, in order to get his 1,5ooth game with the team. Nolan will be with Arbour behind the bench that night. This will certainly be a special day in Islanders Country. I for one plan to be in attendance. It gives the younger Islander fans the opportunity to step into the past, if only for a few hours, and experience a piece of New York Islanders history. Arbour wants a win. If he gets it, I guess that banner at the Coliseum will need to be updated. Personally, I believe that they should have a banner made up just in case he gets the win. At the end of the game, bring the team out, thank Al for coming out and congratulate him over the P.A. system and unravel the new banner over the old one. I think it would be a nice touch. The Islanders today announced that they re-signed 23 year old defenseman Chris Campoli to a 3 year contract worth $600,000 per year. As of right now, it seems that Campoli is in the Islanders plans and will not be dealt. Right now, I think it's fine to have Camps around and that price. The Isles need to definitely acquire 1 new defenseman either by trade or signing. In a perfect world, they would try to get 2 of them but that will most likely not happen. The only way that could happen is if the Isles get rid of Radek Martinek. As good as Martinek has been defensively in his time on the Island, it might be best to explore dealing the oft-injured defenseman. The Islanders can sign a banger in Danny Markov or Ossi Vaananen to replace him, and possibly acquire someone like Derek Morris to round out the defense. That would put this years defense way ahead of what the Isles started last year with. As I posted yesterday, everyone in the organization has been preaching patience and has said that Garth is working very hard. So it should be a relief to most of the fans who have been saying that the team is done adding. If we learned one thing from Garth last year, it's that you can't always believe what you hear. I remember after the Isles traded Zhitnik last year, Snow specifically said no other deals were on the horizon. Meanwhile, just 4 days later Mike York was shipped to the Flyers (same team Zhitnik was shipped to). Snow said nothing was brewing around trade deadline day, and the Isles ended up with Richard Zednik and Ryan Smyth when all was said and done. We also learned that you can trust Garth when he says he is doing something too. A few days before bringing in Marc-Andre Bergeron, Snow said to Greg Logan of Newsday that fans should expect a depth defenseman to be coming in the next few days, or something to that effect. OK, so maybe Snow lied on that one if you consider a depth defenseman as a 7th or 8th type. Bergeron helped spark the power play and put up some awesome numbers for the Isles last season. They will look to Bergeron for his offensive output once again in the upcoming season. Right now, the best power play quaterback on the team is Campoli, and in 05-06 he proved that he was developing into a nice offensive defenseman. He had some injuries last year and had to work his way back into the lineup, but all signs point to him being in the top 6 in 07-08. As of now, there are no new rumors to report. But there is certainly going to be news in Islander Country, it's just a matter of when. Be sure to check back here for updates and opinions when news breaks. With free agency 2 weeks old, the frenzy appears to have concluded. The last big signing was Sheldon Souray to the Oilers for 5 years, $27 million. The Islanders were not willing to go more than 3 years with Souray, and he wanted to cash in on the career year he had with Montreal last season. At any rate, there are still some decent defenseman out there on the market. It is unclear right now what direction Snow plans to go with the defense. Danny Markov, Ossi Vaananen, Andy Sutton and Bryan Berard all are available and have been linked in rumors with the Isles. One Isles target, Vitaly Vishnevski, was snatched up by the rival Devils and signed on for 3 years. Markov plays a very intense style which might be cause for concern if the Isles plan on keeping the oft injured Radek Martinek around. Markov can move the puck well for a defensive defenseman, and could still be on Snows radar. Right now, Markov is looking for a 3 year deal worth more than the $2.5 million he made last season in Detroit. Ossi Vaananen is a very hard hitting defenseman who was the odd man out in Colorado after the season ended. He could be a very nice addition for the Isles and the price might not be very high this late into free agency. Sutton has a huge frame, and was hoping to get a huge pay day as well. That seems to have subsided and he could be had for a reasonable price. I'm very interested in him for his defensive skills that would greatly help the team and Brendan Witt out. Berard could be a potential replacement for Tom Poti if he can prove he's healthy. If he is able to, then I would not mind taking the chance on him. In 05-06, he out up some very good offensive numbers (12-20-32) in a limited amount of games (44) for the Blue Jackets. His -29 was not something to be proud of, but the Blue Jackets aren't something to be proud of defensively overall either. Trade options could be Vancouver's Mathias Ohlund, the Coyotes' Derek Morris and Ed Jovanovski or Toronto's Pavel Kubina. All of them would help the Isles out in some way or another. Ohlund would probable be the best option as he is a very good 2 way defenseman and a definite 1st pairing defenseman. Pavel Kubina would look very good on Brendan Witt's side and would do well on the power play. Jovanovski is a stretch and would need to prove he can stay healthy and he would be quite and addition for the team. He plays an aggressive style and is a good quaterback on the PP. Morris is a decent offensive blueliner who never really blossomed in the NHL yet, but might in Ted Nolan's system. Right now, the Isles appear to be set on forwards except for the fact that they might have a couple too many. This leads many to believe that Snow does intend to trade some to upgrade the defense or maybe even add some offense to the club. The team still needs a 2nd line center capable of 50-60 points and a scoring left winger would be perfect too, however I doubt that the Isles will fill every need by training camp. What seems likely though is that Snow fixes the defense and adds a center, but the wingers we have now are the ones we start with. Right now, the team looks like most teams usually look like in the middle of the summer- a work in progress. It is most definitely not a time to panic yet. I think Snow has a good grasp on what he is doing. The players he has added so far are very good, and I think might surprise some fans. Snow has added some very good depth to the club as well, adding goalie Joey MacDonald, defensemen Aaron Johnson and Matt Spiller, and winger Tim Jackman. The depth defensemen who were signed are ones to be happy about, as they are much needed upgrades over Drew Fata or Allan Rourke. Things are going in the right direction, and Snow and Nolan are trying to build their team. I'm willing to give them the time to do that. I'm not worried right now. If we look the same in September, then I will be worried. Bill Guerin has just been announced as the new Captain for the New York Islanders. After hearing him speak today as I watched the Press Conference live, there is no doubt in my mind that this man was the absolute correct choice to be our Captain. The man has leadership, skills, and class. He acknowledged that they will play as a team, they will do it together. He said that they all wanted to be Islanders. *Comrie and Guerin will each be bringing 50 children suffering from cancer to every Islanders home game this season. A true move of class. Guerin said he will not take the Captaincy lightly, and was surprised to receive it. After watching this PC, I am once again feeling confident. Whats up with the Defense? The answer to that question is not know right now, but it seems that it could be solved pretty quickly. It's just a little past 8 PM, and there is no noise coming out of the Isles camp. There have been rumors floating around about who the Isles are targeting, and there are many names out there that make it difficult to peg who the front runner is for the Isle's vacant defense position. Garth Snow seems to have an increased interest in top free agent defenseman Sheldon Souray. It was originally rumored that Snow lost interest because of the price, but Greg Logan reports that Snow is now interested because Souray's asking price has gone down due to the fact that he is still on the market a week after it opened. Souray might not be the fleetest of foot, but he would definitely help the Islander's blueline out a great deal after they lost both Tom Poti and Sean Hill to Washington and Minnesota, respectively. In my opinion, I would welcome Souray and his shot to the Island if his price has decreased. I would be very interested in seeing how Ted Nolan would work with him and if he could turn Souray from an average defender into a very good defender with a booming shot from the point. Souray could add that star power that Long Island is lacking, and along with Mike Comrie, Bill Guerin, Ruslan Fedotenko and Jon Sim could help the Islanders become a true Ted Nolan team. Other names tied to the Islanders are Danny Markov, Andy Sutton, Vitaly Vishnevski, Ossi Vaananen, Bryan Berard and David Tanabe. Markov plays a very intense style and could be one of the front runners to come to LI. His intense style does lead to some injuries, and last season he only played 66 games. He is very good defensively and would help the islanders out. Markov made $2.5 million last season, and he is looking for a raise over that amount. I think thats why no one has picked him up yet. Vishnevski and Vaananen are both very young, defensive defenseman. They are both very good options for Snow to choose from. Last season, Snow tried to acquire Vishnevski from Anaheim when they decided his arbitration award was much more than they could afford. He spent time with Atlanta and Nashville last year, and is known for his hard hitting. Vaananen is in the same mold as Vishnevski, and for the same reasons would also make for a good addition. Tanabe could make up for what the Islanders lost in Poti, although Tanabe has traveled around a lot in his young career. He could be an option is the islanders are looking for some sort of power play QB, but he is not that strong in his own zone. If I'm Snow, I stay as far away from Bryan Berard as I possibly can. Free agency options haven't been the only thing discussed by the isles brass. There have been many discussions on going the trade route if they feel so inclined to do so. There were trade rumors surrounding the Coyotes' Ed Jovanovski, but those died down. It has not been ruled out though, especially with the recent additions of Bill Guerin and Mike Comrie. Another option could be Toronto's Bryan McCabe. Right now, the Islander's defensive situation is very cloudy. But rumors always seem to include most of the players mentioned above. If I had my choice, I would probably go the free agent route and sign not 1, but 2 defensemen: Sheldon Souray and one of Vishnevski or Vaananen. The I would try and package one or more of Martinek/Campoli/Meyer along with an extra forward to see if we could get some help at center, because the options in the free agent market are lacking at the position. I have a feeling that the Islanders will sign one of Sheldon Souray or Danny Markov. My choice: Souray. Regardless of who they decide to sign, many people are wondering when are they going to be signed. The Isles have a press conference scheduled for tomorrow afternoon at 12:30PM. You would think that they would want the latest addition to be included in that as well, but as I said earlier it's already after 8 and there is no news. The quiet before the storm? Maybe. maybe its possible that someone is already signed, and it is being kept very quiet because they want to surprise everyone tomorrow. That would mean someone like Souray was signed or that McCabe/Jovo was acquired. If someone like Markov/Vishnevski/Vaananen was signed, I think something would have been leaked by now. I suppose anything is possible between now and the presser tomorrow, but it seems like we are still in murky waters when trying to figure out what the defense will look like next year. There certainly seems to be a fire burning. Rumors are circling the web today, saying that the Isles will add another piece to their puzzle. Supposedly, it will be a defenseman. Keep in mind that Sheldon Souray, a long shot for sure, is still out there. Vishnevski, Vannanen, and Danny Markov are all still available. My money says that one of them inks here today. The information is limited indeed, but keep in mind that Snow has been active over the last new dyas, and my gut tells me he will continue to rebuild this team. Keep it here for updates as they come in. Shortly after signing 4 time all-star Bill Guerin, the Islanders announced the signing of center Mike Comrie to a 1 year, $3.375 million contract. Most would have liked to see more years on the deal, but no one is going to complain about adding the 30-30 man. If you recall, I had wanted Comrie to be the Isles second line center this season, but as of right now he is pencilled in as the 1st line center. Comrie said he wanted a 1-year deal to prove to the NHL that he really is a top line center rather than a second. Hopefully Comrie likes the Island, and if he plays well, I hope Garth signs him to an extension. At 26, the fans would really welcome him here for another 3 or 4 years. Talk of Comrie landing on the Island came up during negotiations with Guerin earlier in the day. Guerin and Comrie contacted one another, and both discussed the idea of playing for the Islanders together. Guerin wanted to make sure the Isles would bring in some other players, and Comrie confirmed that they have talked an were close to a deal. Considering how unfortunate the last few days have been for Islander fans, this is much needed. It is unclear as to whether the Isles are done adding forwards or not, but there are still guys out there if they feel inclined to pick any of them up. They may even try and trade for another center, with the Coyotes' Steve Reinprecht being rumored on the block. It has been said that Snow will add another player by the weekend, a defenseman. The most likely option looks like it's Danny Markov, who had a nice season with the Red Wings last year. The other options are Ossi Vaananen and Vitaly Vishnevski. Markov would be a huge upgrade over Sean Hill, on the defensive side, but wouldn't be expected to put up huge offensive numbers. Greg Loagn said in his blog on Newsday's website not to rule Sheldon Souray out either, but to me that seems like a long shot. Rumors are still lingering that the Islanders could land Ed Jovanovski from Phoenix (hence the long shot of landing Souray). Reports from the beginning of the week said the Islanders and Coyotes had worked out a deal, but it was waiting approval from Jovanovski by waiving his no trade clause. At the time, he was lukewarm about the idea of coming to what appeared to be a rebuilding team like the Islanders and stated that he had just started building a house in Arizona. However, with his ex-teammate Comrie now with the Isles, along with the well decorated veteran in Bill Guerin, 'Jovocop' might be singing a different tune by this time next week, maybe signing that tune in Islander orange and blue. The Islanders have announced that they have signed Winger Bill Guerin to a 2 year contract worth $4.5 million per year. The 36 year old had 36 goals and 56 points last season with the St. Louis Blues and the San Jose Sharks. The Islanders tried to acquire Guerin at the trade deadline last year, and after the attempt failed they took the same package and offered it to Edmonton for Ryan Smyth, which was obviously taken. Guerin will be a huge help to the Islanders as they were obviously lacking in players up front. Guerin is a 30 goal scorer and plays similar to Ryan Smyth. When I did my free agent preview, I had Guerin as one of my top targets for the Isles. I figured that if Smyth left, it was almost a sure bet to see Guerin here. But as players were quickly grabbed, I didn't think he would still be out there. He wanted a multi-year contract, and a report surfaced earlier today that the Isles were very interested in Guerin for a multi-year contract. The price might indicate a little bit of an over payment, but I feel it is actually on par for the rest of the signings in the NHL this offseason. Besides, the Islanders will most likely not come close to the $50.3 million cap, so what is there to lose? Most figure that if the Islanders are out of the playoff picture this season and next season, they can get something of value for some of the new signings. However, I don't think the Islanders have this in their plans. More on that in a little bit though. This signing is a very good one for the Islanders, and the fans seem to like it as well. Guerin is a very hard worker who has a ton of grit, and is a very good leader. I love the idea of guys like him, Sillinger and Witt teaching our young players how to play the game. He is definitely a guy that Nolan pushed for, as his style seems to fit the system that Nolan has been trying to preach here. Just some more news and notes: Today, the Islanders also made another move, Trading defenseman Allan Rourke and a 3rd rounder in 2008 to the Edmonton Oilers for a 2nd round pick in 2008. Many fans, including myself and Sean, are wondering if this is going to set the stage for a trade by the Islanders. While that is unclear, the Islanders do seem to be very active on the free agent front. 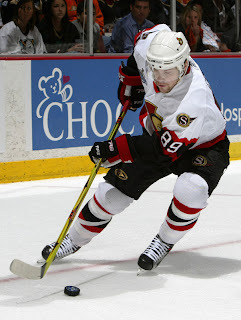 Many sources have said that the Islanders are very close to coming to an agreement with Mike Comrie, and the signing of Guerin today and Fedotenko yesterday might help that idea. It was also mentioned by Greg Logan in his Newsday blog that the Islanders are expected to go after free-agent defenseman Andy Sutton, who will surely help Brendan Witt on the blueline. Also, there has been a rumor floating around that Snow and co. might have a renewed interest in Sheldon Souray. We shall see what goes on, and we will keep you informed. Comrie and Guerin May be Isles soon. Rumors have been saying that the Isles are on the verge of signing Mike Comrie. This would certainly help form a strong line with Comrie as the center. An ESPN radio station is also saying that veteran forward Bill Guerin has been talking to the Islanders over the last few days about putting together a multi year contract. Hopefully these rumors are true, and the Isles can start adding players. No need to fear. There are still plenty of talented hockey players on the market. According to http://www.rds.ca/hockey/chroniques/232191.html, the New York Islanders have signed winger Ruslan Fedotenko to a 1-year, $2.9 million contract. Fedotenko, 28, had a subpar season last year for the Tampa Bay Lighting scoring just 12 goals and 20 assists in 80 games, and found himself in coach John Tortorella's dog house. In 05-06, Fedotenko had 26 goals and 15 assists in 80 games. Fedotenko is more well know for his outstading play in the 2004 playoffs as he was a huge part of helping the Lightning win the Stanley cup (12 goals in 22 games). While this isn't the biggest of names, it certainly does fill a need. At 6'2", Fedotenko plays a decent 2-way game. I'd look for him to be on one of the Isles top lines next season. It is very possible that Nolan can get the most out of him if he can help him out of the confidence issues that he has been known to have. At this point, I'm not going to even complain about price as the Islanders need some players. It is uncler if the Isles have anything else planned right now, but as always we will keep you up to date with the latest. If you guys are looking for the most up to date Islanders news and rumors, you can also look for it at http://herrmannhockeyleague.com. They also have videos, wallpapers, blogs etc. available for your enjoyment. Chris and I give our sincerest thanks to them for supporting us, and in turn we will support them, for WE'RE ALL ISLANDERS! 8:50PM- The L.A. Kings resign netminder Jason LaBabera to a two year deal. 7:45PM- Defenseman Brad Stuart signs with the L.A. Kings. One year, $3.5 million deal. 7:24PM- Brad Lukowich is back with the Bolts. A three year deal . 6:05 PM- The Vancouver Canucks signed G Curtis Sanford to a one year $600,000 contract. 5:15 PM- The Minnesota Wild have agreed to terms with Eric Belanger. Three year, $5.25 million deal. 4:52 PM- The Ducks have resigned veteran LW Brad May to a two year contract. 4:50 PM- The Edmonton Oilers Ink goalie Mathieu Garon to a two year deal. 3:20 PM- The New Jersey Devil have inked Dainius Zubrus to a six year contract. 1:15 PM- The Vancouver Canucks have signed Byron Ritchie and Brad Isbister. NYI Trading with the Western Conference? News has been circling NHL sites claiming that the New York Islanders have potentially struck a deal with a western conference team. Supposedly, the deal is major and should go down if the player waives his no trade clause. Some say it is Marleau, whether he has a NTC or not isn't known to me yet. I'll check on that. Chris and I believe it may be Ed Jovanovski of the Phoenix Coyotes. He would be an upgrade over Poti and would certainly be essential if we can not land Souray. There has been a lot of speculation as to whether or not he will be here. Initial reports say yes, new reports say no. Islander Country would welcome a trade, unless Kyle Okposo is involved. I would dare say that he is probably the trade bait, and if he is dealt away, Isles Country will be in a frenzy. Well, reports initially said Souray was an Islander. Sources informed me and Chris that Souray was signed by the Isles. Then a report comes out that said the Rags have signed him. That report has been refuted. Once again, I have to believe that Sheldon Souray is a New York Islander. As the info continues to roll in, we will keep you informed. First we hear he is coming here. Now we have a report that the Rags have signed him. I wonder if they have the cap space to get him. If he has signed, Shanny has to be gone. Keep it locked here for details. ANDY HILBERT RE-UPS WITH THE ISLANDERS. REPORTS SAY THAT ANDY HILBERT HAS SIGNED A $650,000 CONTRACT TO REMAIN AN ISLANDER. 11:26 AM- The Nashville Predators have signed forward Jed Ortmeyer to a two year contract worth $1.5 million. 1:30 AM-Pittsburg signed Petr Sykora and Daryl Sydor. Both inked for two years, still waiting on a monetary amount for Sykora, but Sydor's contract is worth $5 million. Paul Kariya has signed a three year deal with the Blues. $18 million over the course of three years. $6 million a season. Personally, a little too much for him. This is probably why he didn't come here. Worst Free Agent night in the history of the New York Islanders. Ryan Smyth has signed a 5 year deal worth 31.25 million to play for the Colorado Avalanche. Thats less than what the Islanders had offered him. No movement clause included. I don't know what else to say. Day one has basically come and gone. We lay nearly $15 million under the minimum for the cap, we can't fill three lines, and we have lost all but one UFA. Our only UFA left is Smyth, and we can only hope that he returns and can help bring some other players with us. What makes this hurt the most is that nearly every single player that we were enthusiastic about going after, signed somewhere else. The most painful of all, Drury and Gomez to the Rangers. I do not know how they continue to do this year after year, cap or no cap, they always make these splashes. Something tells me Souray is on his way. That would be nice, but you would hope that you wouldn't grossly overpay him. You pray to whoever your god is that Smyth comes back, which would lead to Comrie. Guerin is still out there, as well as Brad Stuart. Kariya has been rumored to be going to a number of different places. At this point, you need to aggressively pursue him. We need puck moving playmakers. We can hope that Zubrus or Petr Sykora can make their ways here as well. We need goal scorers. If we can get a few of them, we'll be back on track. Our division is going to be at it's most difficult. Philly has Briere, Timmonen, and Hartnell. The Rangers have Gomez, Drury, Jagr, Lundqvist, etc. The Penguins are a hungry fountain of youth. The Devils will be hurting a bit this season without Rafalski and Gomez. My deepest regrets do go out to the fans in Buffalo. You think we feel bad, could you imagine what it must feel like to be a cup-contending favorite, and to watch the team disintegrate before your very eyes, in the course of less than 10 hours? The defending President Trophy Winners have lost their captains, their most impressive offensive sparkplugs. Day two needs to be better. Let's face it, day two can't be much worse than day one. The Islanders have announced that they have come to terms with left winger Jonathan Sim. The 30 year old veteran inked a three year deal. Sim scored 17 goals and 12 assists in 77 games last year with the Thrashers. He fits in well with the Nolan-Style of play, and we look forward to seeing what he can do for us over the next three seasons. Hopefully he will fit in nicely with our style of play. Look for him to potentially replace Chris Simon or Aaron Asham. We're All Islanders, and so is Jon Sim. 7:59 PM- Scott Gomez and Chris Drury are New York Rangers. The blog from Denver that had Smyth signing with the Avs has been DELETED. Thanks to our friends at Islanders Central for their update. We're All Islanders, writing for the same cause and loving the same team. They know they have our support and our help if ever needed. 6:55 PM- The Oilers and Flyers have completed a trade: Joni Pitkanen and Geoff Sanderson are heading to the Oil, in exchange for Jason Smith and Joffrey Lopul. Some speculate that the Oilers have freed up cap space to make a serious run at Gomez. Check back for further developments. 6:52 PM- ESPN's Sportscenter continues to say the Rags have signed Gomez. When they say it, they laugh and giggle. Hopefully this is a speculation. I'm sure that if he had been signed we would know by now. 6:45 PM- According to thefourthperiod.com, the Rangers have offered a deal to Gomez. However, another team that is interested in Gomez has thrown a deal his way. My guess is that it's either the Isles or the Oil. Jason Blake and Paul Kariya have both been offered deals by the Toronto Maple Leafs. 6:34 PM- Eric Perrin signs with the Atlanta Thrashers. 2 year deal worth $1.5 million. 6:20 PM- Ryan Smyth is "close to signing" with the Avs, rumors say. It will be a 5 year deal worth over $6 million per season. Others say he is not exclusively negotiating with them, but it sounds like he is going there. 6:03 PM- Michel Ouellet signs a two year deal with the Tampa Bay Lightning. $1.2 million for the first year and $1.3 million for the seacond. (And i wanted him for the Isles struggling Power Play, damn). thefourthperiod.com reports that the Rangers are the front-runners in the Gomez sweepstakes. 5:59 PM- Jeff Hamilton signs with the Carolina Hurricanes. Two years at $800,000 per year. 5:48 PM- The Isles may be entering into the Gomez sweepstakes. Reports that he was to sign with the NYR have been proved to be false, and he said he would be "ok coming here". More to come as the story unfolds. 4:26 PM: The Flames did indeed sign Sarich, 5 year deal. The Briere signing is for 8 years, 52 million. Unbelievable. The Isles are going to have to overspend for even some of the second tier guys if they plan on getting any. Bryan Rafalski signed with the Red wings for 5 years at 6 million per year. Still some good players left. At this point, we better hope that Smyth comes back to us. But with the way things have gone so far, we don't look like a team putting ourselves in a position to win. 3:36 PM: Sportsnet reports the Flyers have landed Briere. Don't know the terms yet. Also, sources claim the Flames have signed defenseman Cory Sarich. Another Isles target is taken off the market. Things may look bleak right now, but I am still confident in the front office's abilities to get some nice players in here. "Anaheim Ducks sign defenceman Mathieu Schneider to a two-year deal paying him $11.25 million." Islander targets are gradually decreasing. Still some good guys out there, and all of the big names are still there. 2:25 PM: The Florida Panthers make 2 signings, grabbing former Islander Richard Zednik for 2 years and adding Brett McLean for 3 years. The Washington capitals sign former Islander Tom Poti to a 4 year deal worth 3.5 million a season. It is now clear why the Isles are looking at Stuart and Schneider. 2:12 PM: from The Fourth Period: "It looks like the Islanders are looking for a defenseman, along with a top line forward. Brad Stuart's name has popped up, as well as Mathieu Schneider." 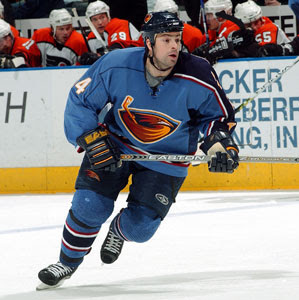 1:53 PM: The Atlanta Thrashers make the first signing, and it's center Todd White. 4 years, 2.25 per year. Nice signing for them. 1:19 PM: Smyth has recieved an offer from a 9th team so far. This was reported on the TSN show. Also mentioned was that Smyth is supposedly going to give the Isles a last chance to top any offers if a team tops their offer. Also sources say that on XM, there was an interview where it was mentioned that Smyth is waiting to see who else the Isles would add and that Garth was heavily pursuing Bryan Rafalski to try to lure Smyth back. Other notes: Iginila is on the verge of signing an extension, believed to be 4 years. Only word on the big 3 so far is there is a possible bidding war going on for Gomez right now between the Rangers and the Flyers; 7 years, 49 million being the offers. Also: Briere has been offered 6 years, 42 million by the Canadians, as per TSN. The Briere race appears to be down to Montreal, LA, Philly and 2 other unidentified teams. 12:52 PM: The Sharks resigned Joe Thornton to a 3 year extension worth 7.2 per year. It doesn't get much better than Thornton, and 7.2 for him may affect the money the big 3 will get. If SJ gets Drury, they may trade Marleau. We shall see. Nothing big appears to be on the horizon yet. It's Christmas in July! Lot of questions surrounding who will go where today. Most of us are curious as to how our team will shape up in the next few days. Will we make a big splash? Will Smyth look at other offers and come back? Is the reported 5 year, $6.5 million per year offer enough to get Smyth to come back? Who are the other free agents that we are looking at? As we get news, I will constantly update this post, putting the time and the player and where they are rumored to go. Right now we are 30 minutes away. The signing period will probably start off a bit slow, but I expect things to pick up by the end of the day, not necessarily with the Isles. Articles this morning have said that the Islanders are expected to make offers to Chris Drury and Scott Gomez, though both of them are most likely long shots. One rumor had the Isles interested in Bill Guerin, which I can definitely see happening. The Islanders also need to shore up on defence, and to help Witt guys like Hannan or Sarich could be brought in. If the Isles don't bring back Poti, then they need to get a puck mover. If they want to spend big that could be Rafalski; if they want to be conservative then maybe go after Teppo Numminen or Roman Hamrlik. Once noon hits, we'll see a ton of rumors, and I will keep you all posted when I hear something. At the end of the day, Sean will chime in with a recap and we'll also offer analysis. So keep checking back throughout the day to see whats going on in Islander Country! DONE DEAL- FERNANDEZ IS A BRUIN. The Minnesota Wild have traded Goaltender Manny Fernandez to the Boston Bruins in exchange for Czech forward Petr Kalus, according to espn.com. The deal was done within the last hour, as the report is timed at 11:56 PM Saturday. The St. Louis Blues have resigned forward for 2 years, $8 million. Tkachuk had been dealt to the Atlanta Thrashers by the Blues, in fear that St. Louis would be unable to resign him. Less than one week ago, his negotiating rights were dealt right back to the Blues in exchange for a draft pick. Adam Mair has decided to remain a Sabre for 3 more years at $2.275 million. The first two year's pay will be $750,000. He will receive $775,000 in the final year of the contract. Mikko Koivu and Martin Skoula will remain Wild Childs for the next few seasons as they have both signed multi-year deals. The terms on the contracts have not yet been released. Koivu was an offensive leader for the Wild last season. He led the team in faceoffs won (583) and faceoffs taken (1,147). He scored 9 Power Play goals, was ranked third among team leaders in assists, forth in goals and fifth in scoring. Skoula averaged 20:14 minutes if ice time for the Wild last season, while ranking fourth in blocked shots (81) and fifth in hits (73). Kariya to the Islanders rumors continue to heat up. Many analysts believe that you could see the playmaking left winger here to replace Jason Blake, whom the Isles have basically given up on (because I say he's going to the Wild!). Ryan Smyth remains a mystery. He is testing the market, but the Isles have offered him a generous deal. Time will tell. *Ted Nolan seemed to be in high spirits today at the Islanders Prospect Camp. He was smiling, shaking hands, and signing autographs. Hopefully this is a sign of good things to come! AND THE BEST PART IS, WE HAVE ONLY JUST BEGUN!! !